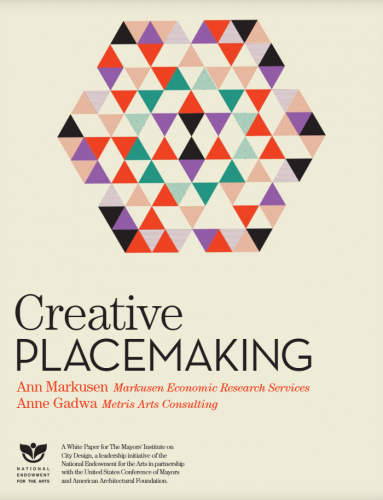 Creative Placemaking explores the livability and economic development outcomes of creative placemaking, whereby cross-sector partners strategically shape the physical and social character of locales around arts and cultural activities. The research summarizes two decades of creative American placemaking, drawing on original economic research and case studies of path breaking initiatives in large and small cities, metropolitan to rural. The report is a resource for mayors, arts organizations, the philanthropic sector, and others interested in understanding strategies for leveraging the arts to help shape and revitalize the physical, social, and economic character of neighborhoods, cities, and towns. A white paper for The Mayors’ Institute on City Design, a leadership initiative of the National Endowment for the Arts in partnership with the United States Conference of Mayors and American Architectural Foundation.